On iPhone 3GS, iPod Touch (4th generation) and iPad(1st generation), the reduced memory of these devices will significantly affect performance. For questions and customer support, please access the link below. You are but a single pig armed with a fan. Use it to fight off the scores of different enemies that come at you! The controls are simple. 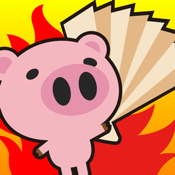 Touch the fan button at the bottom of the screen at the right timing to blow the enemy pigs away. Flick the button up or down to attack the top and bottom rows. Hold the fan button down to charge. The more you charge, the stronger the attack! Once the gauge is full, let go and unleash a Giant Fan attack! Make the most of your idle time to charge! Keep beating enemies back one after another and you'll earn combo points, which increase your score. Quickly beat as many foes as you can to increase your combo points! Keep beating back foes without swinging and missing and the Rage Gauge on top will continue to fill. Once it's full, you'll get to use your Huge Fan until your bonus time runs out. Now's your chance to increase your Combo points like crazy!